As you know already soul sister, we are pure energy and all energies affect us. Even holistic living can be stressful. Whatever we're doing, people and places affect our mood and can bring us down. We can pick up negative energies that are not even ours and feel tired, deflated, annoyed and fed up. All this can bring our vibration right down. And when we feel frustrated, fearful or angry we are vibrating at a lower frequency. Now I want to say that its totally OK to feel these emotions, we should never repress or try to stifle our feelings, better to go into the feeling and own it. But we need to remember that we attract and manifest our vibrational match so we don't want to get stuck there for too long. If you are feeling stuck and unfulfilled then the chances are your energy is vibrating at a lower rate too much, as the level of our frequency determines the reality around us. 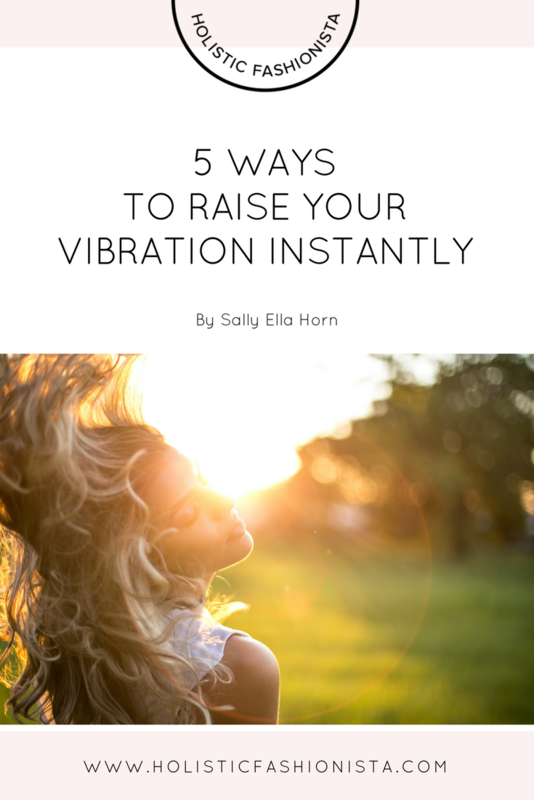 The great thing is there are several ways to quickly and easily raise your vibration. And as your vibration changes, you'll attract and become a magnet for the same higher vibrations back. Like attracts like. If you want to attract or manifest better things in your life, or if you are blocked in fulfilling a dream, then you need to raise your vibration. Connecting to Light, Universal Energy, Source, God – whatever you want to call it, is a very powerful exercise but so simple and you can do it anywhere and at anytime. You are the embodiment of Source Energy and this Source Energy is within you so just your intention to connect more fully with it has a profound effect. Visualize your aura expanding out and up above the earth then draw the light down, through your Crown Chakra, into your head and 3rd Eye, opening up your intuition, down through your throat and thymus, expanding your heart energy, charging your solar plexus, and down into your abdomen, your base chakra and through your legs and into your feet. Then see it flowing back up into your heart chakra and let the light flood out from your heart into your aura, pushing your energy field out. See your energy expanding out around you like a big ball, full of light and high frequencies. Blessing someone, something or yourself is so easy and yet it has a very powerful enlightening effect on your energy and gets those good vibes flowing strong. All you need to do is simply say in your mind 'I bless you', or even more powerful is to say 'I bless you with pure love and light', or 'I bless you with pure source energy'. Say this or something similar to every person you meet or pass by, and make sure you say it to yourself. But you have to feel it also, so its not just words. Like all words, if you don’t connect any feeling to them, they lose their power and potential. Get the feeling of joy and love and infuse that into those words as you say them to the other person. Being in a wood, field, park or on a beach connects you to the Earths energy. Mother Earth has her own vibration and her therapeutic power is a natural mood enhancer which straight away raises your frequency. It can also be healing as the earth carries a charge which is a great source of antioxidants and electrons that destroy free radicals. Research has found that placing your bare feet on the ground – called 'Earthing', can help you soak up this energy more effectively. It is thought that Earthing can help with a variety of chronic diseases and is effective in combating stress, inflammation, pain and insomnia. So get outside and if you can, and its warm enough – take off your shoes! Laughing raises your vibration and lifts your mood. We all love having a good laugh and its even better when we can share it with a friend or loved one, perhaps over a glass of organic wine or green smoothie. Think about whats fun for you, what makes you laugh or giggle. It may be watching a funny movie or a reality TV program that is so awful its hilarious! For me I love watching my dogs play together – their antics make me laugh out loud. Make a point of laughing more and give the space in your life to do so.